The game on Wednesday night against Florida Southern was the game of the week. There was so much action and the stands were almost filled with students, friends, and family cheering. The Tars entered their first game for the Sunshine State Conference with a tough but great shutout win over Florida Southern. The only goal for the 1-0 game was made by Fritz Engler ‘18, moving Rollins to 3-0-1 on the year and 1-0-0 in conference play, while Florida Southern falls to 2-1-0, and 0-1-0 in SSC action. In the first half both teams battled constantly, back and forth, each building up chances to put the ball in the back of the net. The one and only Julian Grundler ‘18 finished the first half with three saves, and turned away multiple one-on-one chances from the Mocs. Even though the Mocs outshot the Tars 6-5 in the first half, Rollins continued to give it all they have to get the win. Now in the second half, the action intensified as Rollins worked to take possession and gripped on the game. Florida Southern did miss a golden chance halfway through the second half, missing an open net when Grundler was caught, rushing towards the long pass. 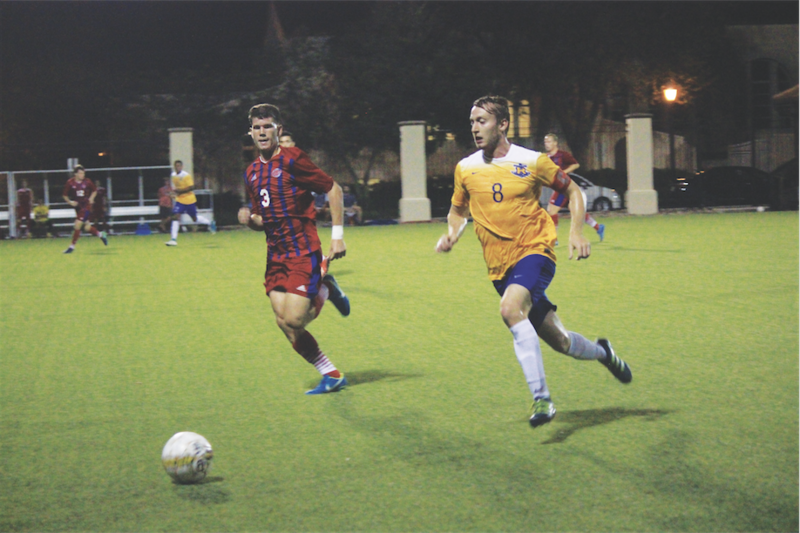 It was scoreless until the 81st minute, when Rollins’ increased pressure earning them more chances at goal. It was a corner and Junior captain Johnny Nartowicz ‘18 took it, which was deflected by Liam Luke ‘20 who then fell to Senior Engler, who tipped it to the back of the net and the crowd went wild with a point on the scoreboard. Luke’s deflection, on the game winner, earned him an assist and his first point in a Rollins uniform. Florida Southern tried to pick up the pressure looking for an equalizer, but nothing came through Grundler who blocked the Mocs most promising attack in the closing seconds, solidifying Rollins for the win. The Tars are now 51-13-10 all-time against Florida Southern. Head Coach Keith Buckley improves to 309-148-30, as he is into his 27th season for the Rollins soccer program. Rollins will continue to work hard and get more wins at the Sunshine State Conference play, including their next game to Miami to take on the Barry University Buccaneers. The match is scheduled for Saturday, September 23, at 6 p.m.
Rollins also climbed one spot higher in the NCAA Division II United Soccer Coaches National Poll, settling at the Top 20.